The Fermi Gamma-ray Space Telescope’s Large Area Telescope caught sight of the first gamma-ray pulsar ever seen outside the Milky Way, PSR J0540-6919, which is also the most luminous gamma-ray pulsar ever found. 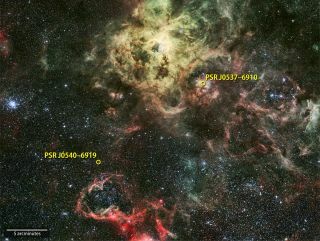 The telescope also imaged another powerful pulsar nearby, PSR J0537-6910. Researchers have spotted the most luminous gamma-ray pulsar ever found — and the rapidly spinning, ultradense stellar core is also the first pulsar of its kind ever seen outside the Milky Way. A group analyzing data from the orbiting Fermi Gamma-ray Space Telescope's Large Area Telescope discovered the extraordinary object in an area bursting with star activity: the Tarantula Nebula in the Large Magellanic Cloud, a satellite galaxy to the Milky Way. Scientists have previously seen this specific pulsar emitting other wavelengths of light (such as X-rays), but this is the first detection of a pulsar outside the Milky Way blasting high-powered gamma-rays. "It turns out that this pulsar is the most luminous gamma-ray pulsar known so far, and it was also the first one detected outside the Milky Way," said Pierrick Martin, a researcher at France's Research Institute in Astrophysics and Planetology (IRAP) and co-author on the new paper reporting the finding, which is published in the journal Science. "The previous record holder was the so-called Crab pulsar, in the Crab Nebula, and the pulsar we have found is 20 times more luminous — that's a huge gap in luminosity." "Time will tell if this extraordinary object will lead to breakthroughs in the understanding of pulsars," Martin added. When massive stars explode in supernovas at the end of their lifetimes, if they don't collapse into black holes they can leave behind incredibly dense cores called neutron stars.The rapidly-spinning objects are the size of a city with about 1.4 times the mass of the sun. Some neutron stars blast out powerful beams of radiation from their poles as they spin, and if the beams of light sweep past Earth during the core's rapid rotation, scientists see it as a blinking, regularly repeating signal: a pulsar. They also found some evidence for gamma-ray emissions from a second, nearby pulsar that has staggeringly high energy output overall — the most powerful pulsar known, the researchers said — but they couldn't detect the tell-tale pulsations in gamma-rays. Because the two pulsars are so close by each other, their output was easy for the researchers to compare, said Victoria Kaspi, an astrophysicist at McGill University who was not involved with the study. They could also compare them to the previous record holder, for largest gamma ray output — a pulsar in the Crab Nebula. This newly measured pulsar had actually been nicknamed the "Crab twin" because it's often compared to that flashy pulsar. "The surprise is how different they are: the so-called 'Crab twin,' is not such a twin at all — in observable gamma-ray emission, one is far more powerful," Kaspi told Space.com. "They remind me, at least as far as gamma-rays go, of the movie starring Danny DeVito and Arnold Schwarzenegger as twins!" Fermi's Large Area Telescope has low resolution compared to many other telescopes, so for more insight into the pulsars researchers can combine the telescope's measurements with data from other observatories, like NASA's Swift satellite, which also detects gamma rays, or telescopes that measure other radiation with high precision. To make their first detection of the pulsar's gamma rays, the researchers combined the Fermi observations with data from an X-ray telescope. An upcoming experiment, the Neutron Star Interior Composition Explorer will measure X-rays once it is mounted on the International Space Station to contribute to this type of pulsar research. A gamma-ray view of the star-forming region where the gamma-ray pulsars were spotted shows the intense glow of the two neutron stars. "We spent decades trying to figure out exactly how they emit high-energy X-rays and gamma-rays, and we're still struggling with that," Frank Marshall, an astrophysicist at the NASA Goddard Space Flight Center and co-author on the paper, told Space.com. "These pulsars that look similar but have quite different characteristics are an opportunity to better explore how they're making those gamma-rays. "The data already gathered about the unusual pulsar will be helpful in modeling the process inside it that creates so much radiation — and the fact that the pulsar is so efficient, creating so much gamma radiation compared to its overall power level, makes a useful edge case. Paul Ray, an astrophysicist at the Naval Research Laboratory, who was not involved with the study, added that researchers who know the pulsar's radiation in detail can get a much better glimpse into the region around it, the Tarantula Nebula and the Large Magellanic Cloud overall. "Both for studies of the LMC itself and for studies of this very select group of superenergetic, very young pulsars that are only around 1,000-ish years old, it's really a powerful result," he told Space.com. Before the Fermi Large Area Telescope, Ray added, only six gamma-ray pulsars had been identified. Now, they've discovered more than 160, all within the Milky Way. This pulsar, whose intense gamma radiation is newly revealed, shines out from more than five times the distance from Earth to the center of the Milky Way — 160,000 light-years. "It was completely unexpected that Fermi would be able to detect a pulsar in another galaxy than the Milky Way," Martin said. "Many people would have bet money against it."